“Ladies and Gentlemen, please welcome Coronado Rotary’s speaker from somewhere off the California coast. Rotarian Ginger Cox finished her introduction and turned to the video screen where D’amy Steward, Coronado High School alum and Duke University junior, welcomed more than 100 Coronado Rotarians to a live-streamed video chat. D’amy, reporting in real time from the Research Vessel Falkor during the Rotary meeting. D’amy, reporting in real time from the Research Vessel Falkor said the vessel was in the Cascadia Margin. The Cascadia Margin is an area offshore of Washington, Oregon and northern California. During the “Ship to Shore” live streaming, the ship was off the coast just south of Salem, Oregon. 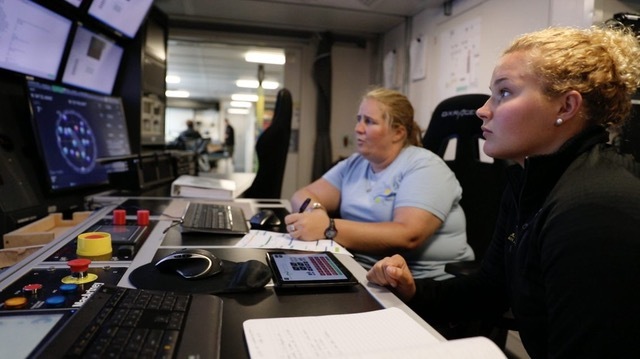 The goal of this Schmidt Ocean Institute voyage on the Falkor is to collect valuable mapping data for unsurveyed areas in search of methane seeps from the ocean floor. The large number of methane seeps discovered during previous expeditions to the area (2700) are establishing a baseline inventory of methane bubble streams on the Cascadia Margin. Only 40% of this margin have been mapped. 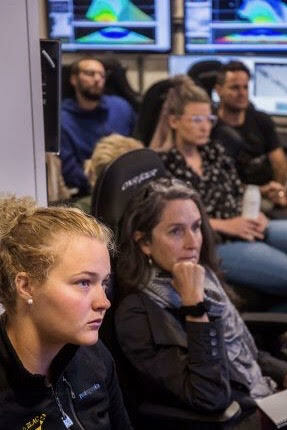 Along with the Artist-At-Sea participants, Student Opportunities participant D’Amy Steward listens during a presentation by chief scientist Susan Merle explaining plans for the mapping expedition aboard the Research Vessel Falkor. ”By mapping the margin, we will be able better quantify the current methane flux on the US west coast continental margin and watch the changes with climate change,” D’amy said. 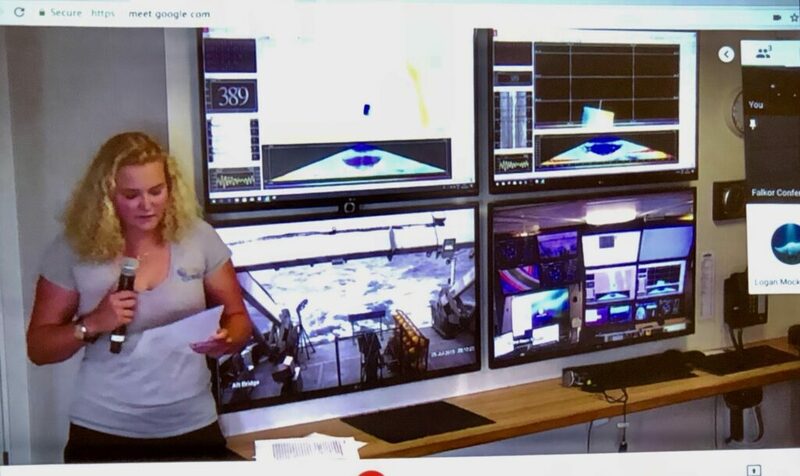 Marine Technician Deb Smith teaches Schmidt Ocean Institute Student Opportunities participant D’amy Steward about R/V Falkor’s multi-beam sonar control room. This is also Schmidt Ocean Institute’s first artist-dedicated expedition. Six unique artists have come aboard the Falkor, using the mapping mission and life at sea as inspiration for their work. The participants’ creations span a wide-range of disciplines – from drawing, block prints, and sculpture, to performance art and jewelry design. Like scientists, artists conceptualize and put together ideas in new ways. By providing a time and space where experts from different disciplines can work together and share ideas, the experience aims to transform both the scientists’ and artists’ outcomes. 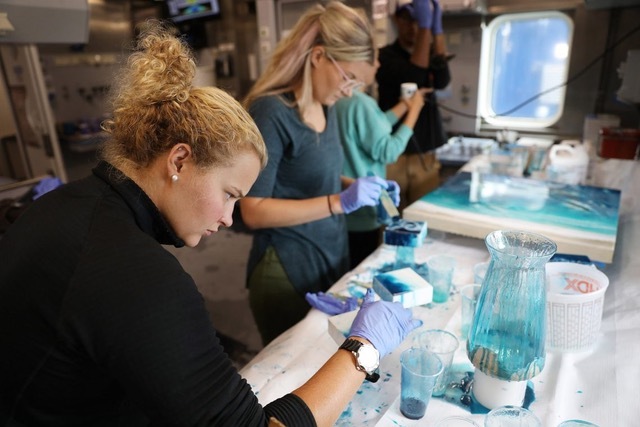 D’amy Steward participates in a workshop led by Artist-At-Sea Sarah Caudle, creating resin paintings at a workspace in Research Vessel Falkor’s wet lab. Having grown up on and in the ocean, D’amy has been involved with ocean conservation and education for as long as she can remember. During high school she became involved with several conservation organizations, serving as West Coast Ambassador for Sailors for the Sea and as member of the Youth Leadership Council for EarthEcho International. D’amy founded Ocean Steward, an ocean conservation and outreach organization and blog designed to educate the public about ocean health and inspiring others to act. She is passionate about wanting people to understand the problems plaguing our oceans; the work being done to study our world’s greatest resource, how they can help; and letting them know that their efforts makes a difference. For Coronadan D’amy, the ocean was the incredible backyard filled with wonder and excitement. She could swim before she could walk and scuba dive before she could drive. Since the age of three, D’amy has been at Rotary beach clean-ups with her dad, Coronado Rotary Past President Dan’l Steward. D’amy was president of the CHS Interact Club and a recipient of Coronado Rotary’s Service Above Self Scholarship. Her dad and mom (Amy Steward) encourage and inspire her as she pursues her passion and determination to help make a difference. D’amy is entering her junior year at Duke University where she is double majoring in Biology with an Ecology concentration, and Environmental Science with a Marine Science and Conservation concentration. She is a Rachel Carson Scholar and will begin her research Fall 2018 at the Duke University Marine Lab in Beaufort, North Carolina, studying the ecological impacts of derelict fishing gear, resulting from ghost fishing, to improve ecosystem restoration efforts. Next summer D’amy will intern with National Oceanic Atmospheric Administration (NOAA) as a Hollings Scholar.